Bahco cutters. 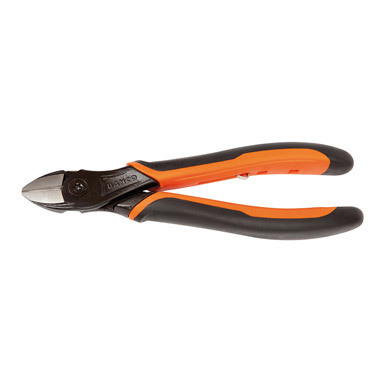 With twin cutting ability the side cutting plier with progressive edges is specially designed to cut hard materials such as piano wire close to the joint and to cut softer materials such as copper wire and plastic insulated wire at the tip. Finish: Black oxidised, anti-corrosion treated. Material: Chrome-Vanadium. With Ergo handles in two-material combination. Thermoplastic surface on tough polypropylene which gives a superior grip. Shape: An "open" joint, in which the distance from the joint centre to the cutting edges is reduced, resulting in greater leverage and increased cutting capacity. Progressive cutting edge which cuts hard material near the joint and soft materials at the tip. Rounded jaws give improved accessibility in confined spaces. Equipped with a return spring featuring an on/off function. Ergonomically designed with black oxidised ergo grip.